The trigeminal nerve is the largest cranial nerve, which serves both sensory and motor functions. Neuropathy is a general term that refers to diseases or malfunctions of the nerves. Sensory disturbances are usual manifestations of trigeminal neuropathy, where one or more divisions of the nerve may be involved. The predominant signs of these can be allodynia and hyperalgesia in the territory of the involved division of the trigeminal nerve. Combined motor and sensory involvement can occasionally be seen in a mandibular branch (V3) lesion, as combined sensory and motor fibers form the fascicular portion, prior to the exiting at the lower pontine level. However, isolated neuropathic involvement of the motor branch of the trigeminal nerve is rarely reported. Chia, in 1988, described the disease for the first time in five cases, wherein, aching pain and unilateral weakness of mastication were the main features. Since then, only 15 cases were reported on the disease, making diagnosis of such a condition more challenging [Table 1]. The diagnostic criteria of the disease are yet to be determined, but they are usually diagnosed by specific features, such as, wasting and weakness of the jaw muscles, without any sensory facial disturbances. Atrophy of the jaw muscles can be confirmed by electromyography and computerized tomography (CT) or with magnetic resonance imaging (MRI) of the head. The imaging features of the disease can show unilateral atrophy and infiltration of the fatty tissues in the muscles of mastication. Many etiological factors have been proposed for the disease. ,,,,,,,, We present a rare case of a patient with unilateral trigeminal motor weakness and muscle atrophy, not accompanied by trigeminal sensory involvement. A 25-year-old male patient reported to us with a complaint of pain over the left side of face since one year. The pain was of a very dull and boring type and was continuous. It usually increased on chewing. There was no reduction in mouth opening. He had no preceding febrile illness, head trauma or stroke. Clinical examination revealed that there was hypotrophy of the left masseter muscle giving a sunken appearance in the cheek area [Figure 1]. No abnormality was detected in the functions of the temporomandibular joint (TMJ). The patient's deglutition, voice, and tongue motion were normal. The patient was referred to a neurologist. The neurological examination showed weakness and wasting of the left temporalis and masseter muscles. The corneal reflex and facial sensation were normal. Conduction in the left facial nerve, blink reflex, and brainstem auditory-evoked potentials were all normal. 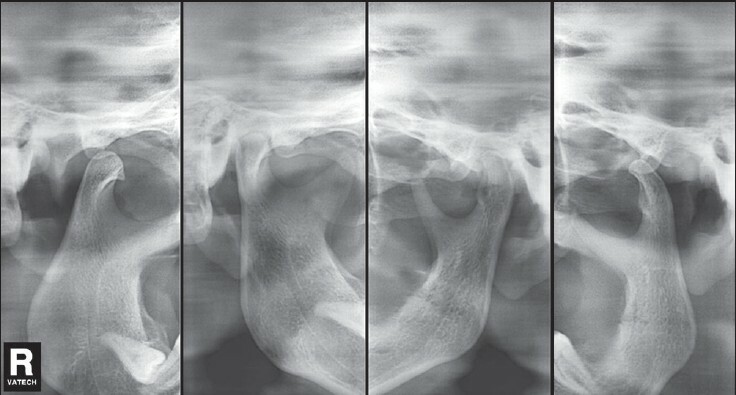 Panoramic imaging of the jaws and TMJ revealed marked atrophy of the ramus of the mandible, as well as deformity of the condyle on the left side [Figure 2] and [Figure 3]. An MRI was performed with a 1.5 T MR scanner. The MR protocol consisted of coronal, axial, and sagittal, T1- and T2-weighted images and a fat-suppressed T2-weighted image of the face and TMJ. 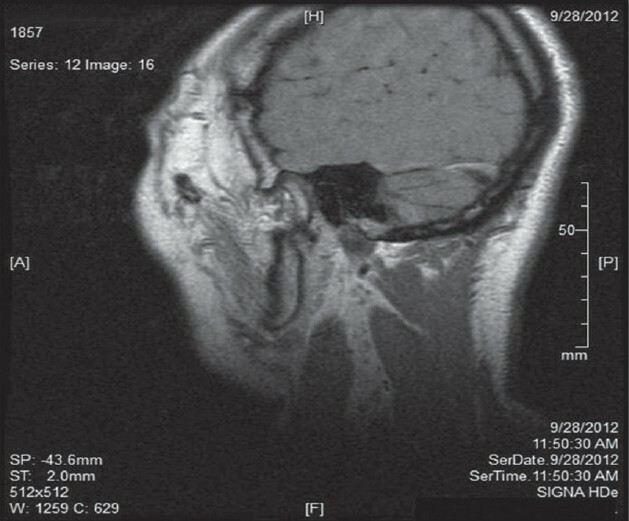 The MRI of the face revealed severe atrophy and fat replacement of the left trigeminal motor nerve innervated muscles (i.e., the temporalis, masseter, medial, and lateral pterygoid) [Figure 4] and [Figure 5]. The MRI of head showed no space-occupying lesions or degenerative changes in the brain, brain stem or mandibular nerve branch. His left facial pain was attributed to myalgia of the muscles of mastication on the left side. An ointment containing non-steroidal anti-inflammatory drug (Diclofenac sodium) was prescribed for local application externally, thrice a day, along with a muscle relaxant, in case of aggravation of pain. The medication only provided temporary relief. Atrophy of the muscles of mastication on the left side (assessed by palpation). Severe atrophy of the left mandibular ramus. Atrophy and fatty infiltration of all muscles innervated by the left trigeminal motor nerve. No disturbance in the sensory function of the left trigeminal nerve. These features were in accordance with the case series reported by Chia. The other associated features such as deviation of jaw on the ipsilateral side of the jaw and reduced mouth opening were also reported by few authors. ,,,,,, Deviation of the jaw could be a result of paresis of the lateral pterygoid muscle or a result of altered TMJ disk position, due to distortion of the shape of the condyle. None of the previously published cases reported atrophy of the facial skin or subcutaneous tissue. Hence, it could be concluded that hemifacial atrophy in this condition was not progressive. Although the etiology of pure trigeminal nerve motor neuropathy is still unknown, few authors have observed lesions in the form of an infarction or a tumor near the pontine tegmentum or foramen ovale, which were considered as the major etiological factors. ,,, Few other authors believe that viral infections can be responsible for the condition. , Some authors have considered cranial trauma and multiple sclerosis to be the cause of pure trigeminal nerve motor neuropathy. , However, evidence to support such facts are very few. In our case no lesion was observed in the MRI of the brain and the cause of the condition remained unknown. Differential diagnosis of the disease is important, clinically as well as radiologically. The substitution of muscle with fibrous and fatty tissue is an unspecific, secondary degeneration of the affected myocytes that may follow either a myopathic or a neurogenic process. It may occur in a number of conditions involving the skeletal muscles other than pure trigeminal nerve motor neuropathy, such as, inflammatory, infective, congenital, and metabolic myopathies and diseases of the lower motor neuron, including, either the anterior horn cell or the peripheral nerve. In Duchenne muscular dystrophy, fat replacement is a consequence of an anomalous product of the dystrophin gene, causing a membrane defect, in which increased uptake of calcium leads to fibrous necrosis. In acquired toxic and post-traumatic myopathies, the characteristic fibroadipose change depends on anterograde and retrograde denervation, respectively. In all these diseases, the most common feature is the bilateral and/or multiple muscle involvement. An involvement of a single muscle is possible in post-traumatic myopathies and in paralysis following poliomyelitis, either in the acute phase or several years after the first symptoms. This kind of paralysis usually occurs at a young age, with preferential involvement of the lower or upper limbs, which may also be asymmetrical. ,, On account of the deviation of the jaw and pain in the masticatory muscles, the condition can also mimic a TMJ disorder. 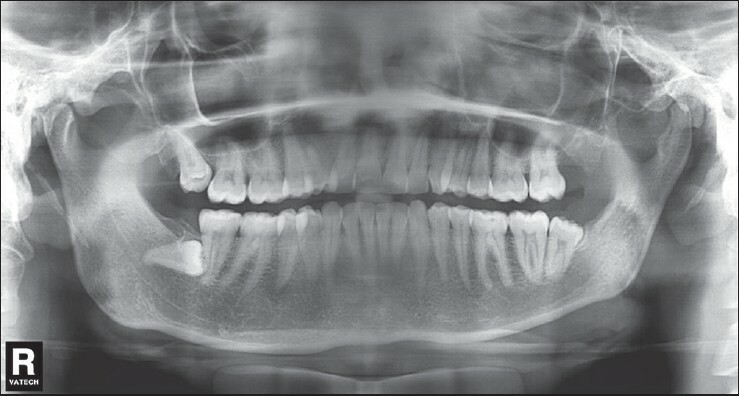 Our patient had noticed pain since the past one year, hence it was difficult to determine the onset of the disease, but the skeletal atrophy of the left mandibular ramus strongly suggested that this disorder could have occurred in childhood or in early adolescence. The manifestation of motor denervation varies with the chronicity of the process. Chronic long-standing trigeminal motor denervation lasting for more than 20 months results in marked volume loss of the affected musculature and extensive fatty infiltration. The present patient had findings consistent with long-standing chronic denervation atrophy. As long-standing trigeminal motor denervation is irreversible, no effective therapy is available for patients with pure trigeminal motor neuropathy. The MRI findings of atrophy of the trigeminal nerve-innervated muscles added diagnostic evidence to the clinical and electrophysiological findings of denervation of the masticatory muscles. Hence, it is recommended that all patients with suspected trigeminal motor neuropathy require a neurological examination by a neurologist, and that these patients should undergo MRI of the face and head, to evaluate the sequelae of denervation and to rule out an intracranial or extracranial lesion. We have reported a rare case of left pure trigeminal nerve motor neuropathy in a 25-year-old male patient, in whom all the muscles innervated by the left trigeminal motor nerve had undergone atrophy, which resulted in atrophy of the left mandibular ramus and wasting of the muscles. The MRI proved to be the key for effectively diagnosing the case. However, we were unable to find any causative factor in this case. Chiba M, Echigo S. Unilateral atrophy of the masticatory muscles and mandibular ramus due to pure trigeminal motor neuropathy: A case report. Oral Surg Oral Med Oral Pathol Oral Radiol 2012;113:e30-4. Uesugi S, Nakayama H, Higashi M, Suzuki M. Isolated trigeminal neuropathy involved with motor dysfunction due to small infarction in the pontine tegmentum. Brain Nerve 2010;62:987-90. Anheim M, Echaniz-Laguna A, Rey D, Tranchant C. Pure trigeminal motor neuropathy presenting with temporo-mandibular joint dysfunction in a patient with HIV and HCV infections. Rev Neurol (Paris) 2006;162:92-4. Takamatsu K, Takizawa T, Miyamato T. A case of pure trigeminal motor neuropathy. Rinsho Shinkeigaku 1993;33:541-5. Chiba S, Motoi Y, Noro H, Asakura K, Matsumoto H. A case of pure trigeminal motor neuropathy. Rinsho Shinkeigaku 1990;30:883-7. Beydoun SR. Unilateral trigeminal motor neuropathy as a presenting feature of neurofibromatosis type 2 (NF2). Muscle Nerve 1993;16:1136-7. 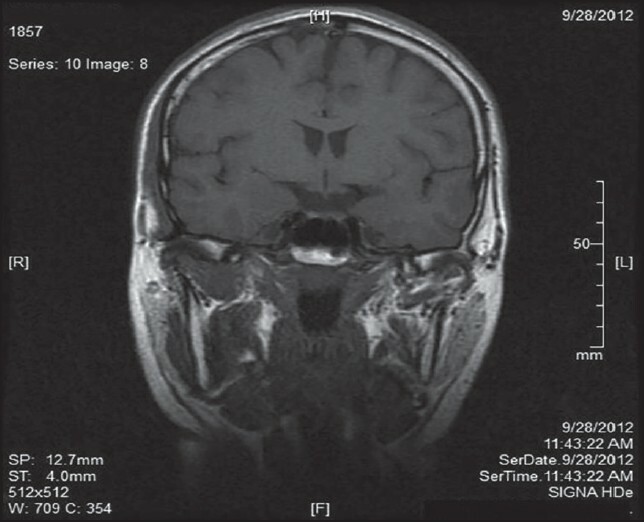 Kang YK, Lee EH, Hwang M. Pure trigeminal motor neuropathy: A case report. Arch Phys Med Rehabil 2000;81:995-8. Ko KF, Chan KL. A case of isolated pure trigeminal motor neuropathy. Clin Neurol Neurosurg 1995;97:199-200. Hadar H, Gadoth N, Heifetz M. Fatty replacement of lower paraspinal muscles: Normal and neuromuscolar disorders. AJR Am J Roentgenol 1983;141:895-8. McConnell JR, Daneman A. Fatty replacement of muscles adjacent to spinal osteoid osteoma. J Comput Assist Tomogr 1984;8:147-8. Orrell RW, Peatfield RC, Collins CE, Woodrow DF, Moss J, Press M, et al. Myopathy in acquired partial lipodystrophy. Clin Neurol Neurosurg 1995;97:181-6. Russo CP, Smoker WR, Weissman JL. 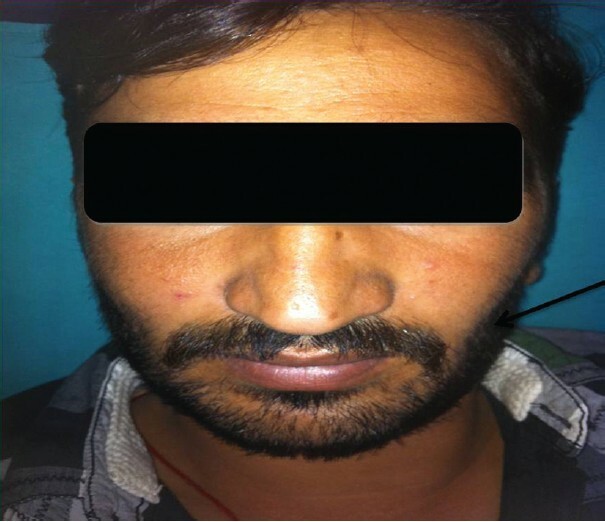 MR appearance of trigeminal and hypoglossal motor denervation. AJNR Am J Neuroradiol 1997;18:1375-83.